Last week, Gov. Mike Pence (R) signed Indiana’s so-called Religious Freedom Restoration Act, or RFRA, into law. The legislation, which is significantly broader in scope and impact than the federal RFRA or similar laws passed in other states, would potentially grant a license to discriminate against LGBT Hoosiers throughout the state. While discrimination against lesbian, gay, bisexual, and transgender, or LGBT, individuals was legal in most of Indiana before, this new law effectively nullifies existing municipal LGBT nondiscrimination protections in places such as Indianapolis. In response, several major businesses—ranging from Salesforce, of which the Center for American Progress is a client, to Angie’s List—have announced that they will protest the new law by either eliminating or dramatically reducing spending in the state of Indiana. Angie’s List’s announcement alone cost the state $40 million and 1,000 jobs. Other companies and associations, such as the NCAA and the Christian Church (Disciples of Christ) denomination, have suggested that they may need to re-evaluate future economic activity and events in the state due to the discriminatory bill. Based on publicly available estimates of the economic impact of lost or at-risk business activity or events, the Indiana economy could potentially lose out on $256.4 million and counting over the next six years. 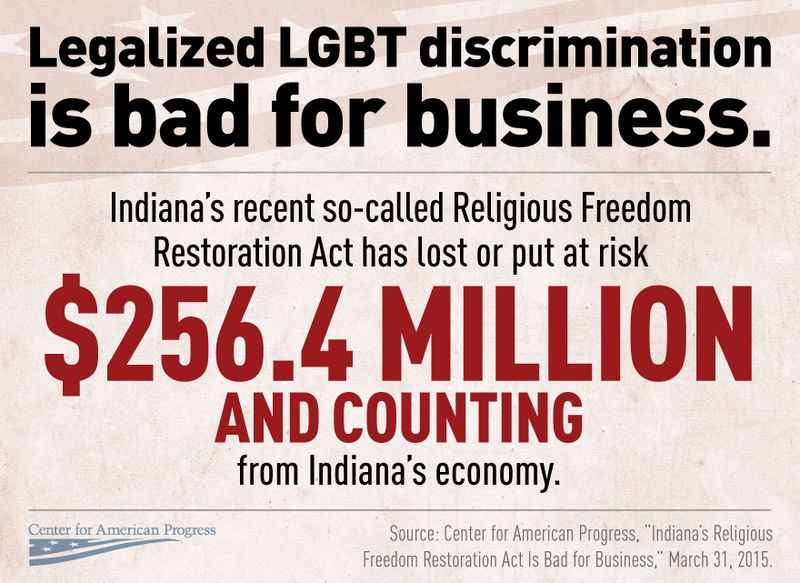 Discrimination of any kind is wrong, regardless of the economic impact. But it is also clear that anti-LGBT discrimination is bad for business and bad for the nation’s economy, which is why a large majority of Fortune 500 companies ban LGBT discrimination. 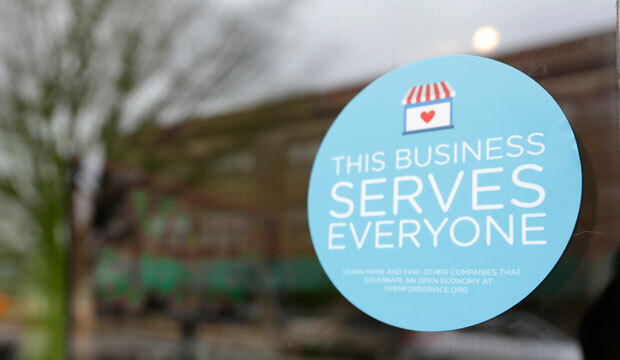 It is time for state legislators and Congress to ensure that all workers and customers are treated fairly by passing explicit protections from discrimination in employment, housing, public accommodations, and other areas of life for all Americans. Note: Some estimates of economic impact are based on identical events in other states or other years. Sarah McBride is a Research Associate on the LGBT Research and Communications Project at the Center for American Progress. Laura Durso is the Director of the LGBT Research and Communications Project.